Patola has a royal history! Silk weavers of the salvi caste from the states of Karnatak and Maharshtra chose Gujarat as the home for their renowned patola fabric. At that time the ruler used to dress in patola silk himself on special occasions. 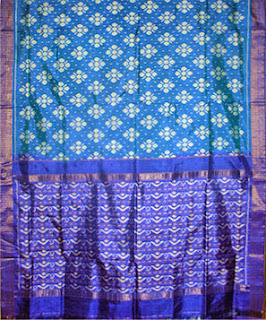 Patola saris from Patan are renowned for their colorful diversity and geometrical style. To create a patola sari, both the warp and weft threads are tie-dyed according to the desired pattern on the final woven fabric. 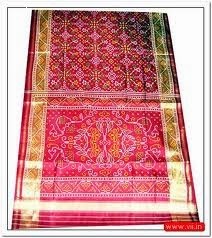 (In traditional ikat, only the warp or the weft is dyed.) The bundles of thread are strategically knotted before. The weave is a double ikat, usually made from silk. Patola-weaving is a closely guarded family tradition. There are three families left in Patan that weave these highly prized double ikat saris. It can take six months to one year to make one sari. Women's dresses are very attractive and full of colors and geometrical patterns. The soft fabric is not block printed. Its weaving and tie method results in identical patterns on both sides of the cloth. It involves complicated calculations; the base of the sari is totally stood on geometrical creations. The process of making of the sari starts with dyeing the wrap and the weft yarns according to the planned pattern of the final cloth. 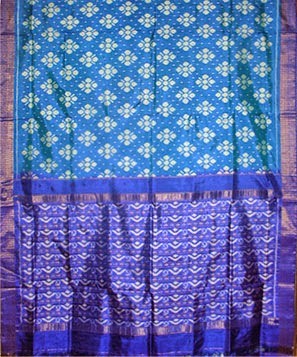 Silk yarn is used, and patola saris are hand-woven. The procedure is not only costly, but also time-consuming. The market for patola saris is very limited. There are four distinct patterns which are woven primarily in Gujarat by the salvi community. In Jain and Hindu communities, double ikat saris with entire designs of parrots, flowers, elephants, and dancing figures are generally used. In Muslim communities saris with geometric designs and flower patterns are typical, and worn mostly for weddings and other occasions. Maharashtrians wear saris woven with plain, dark colored borders and body, and a bird design called Nari Kunj.